This deliciously rich, classic pasta sauce has been a longtime family favorite – now, adapted for your slow cooker! 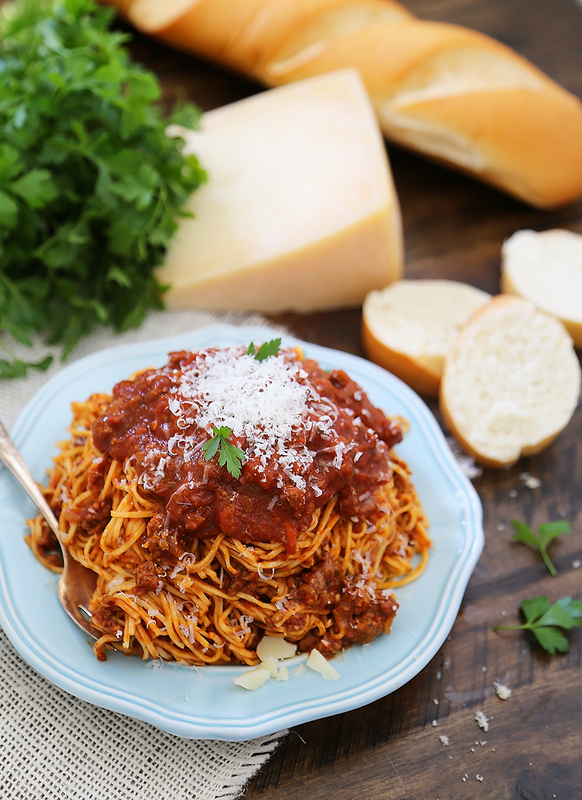 It doesn’t get better than a spaghetti Bolognese for a warm and comforting weeknight meal. The sauce is simple to make and freezes well, too! This recipe was created for Holland House Cooking Wines. All opinions are my own. Finally! Sweater weather is upon us in Austin, though just barely, but I’m taking the opportunity to reintroduce some favorite fall dinners. Though I use my slow cooker year-round (great for keeping my hot kitchen cool in the Southern summers), it really becomes my workhorse for warm fall and winter meals. I especially love the ease and aroma of a slow-cooked meal waiting for me at the end of the day. If you’re like me and work from home, this hearty, irresistibly good Bolognese sauce will have you watching the clock all day long. Dinner can’t come soon enough with something this delicious bubbling away! 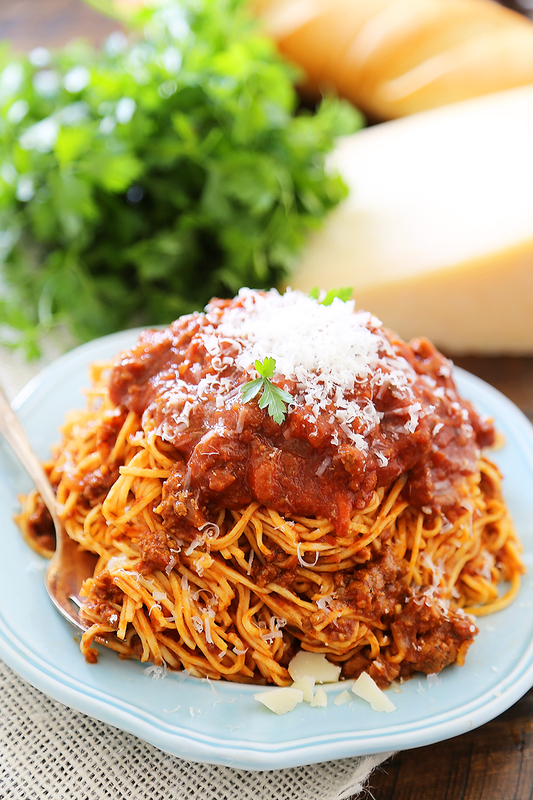 Bolognese is a terrific traditional Italian sauce, with a texture that’s both thick and silky-smooth, and a taste that is tangy, savory and full of herbaceous aromas. Some like to simmer in chopped carrots and celery for extra depth of flavor. Since I don’t always have those on hand, and assume you may not either, I wanted to keep it simple (but just as scrumptious) today! Ready to twirl your fork around a bowl of this saucy goodness? Since this recipe makes a double batch of Bolognese sauce, it will easily feed 8-10 hungry dinner guests. Or, you can freeze the sauce in small or large portions to use for later. A little thinking ahead is always a major time saver, when I want a homemade meal without much effort. Just boil some pasta to toss with your defrosted and warmed-up sauce, and you have a belly filling meal with only a few dishes to clean up. It’s a dinner win! Now, a little note about cooking the beef, onions and garlic before adding them to your slow cooker. This is a necessary step. Trust me. When I began making slow-cooked sauces with ground meat and meatballs, I assumed you could just add the meat to the sauce, raw and uncooked. What resulted was not good. The ground meat essentially melted into the sauce, creating a mealy texture that was unpleasant and devoid of flavor. You need that flavor and texture that comes from sizzling the meat in your skillet before slow-cooking. 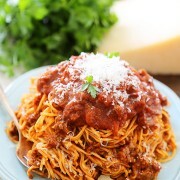 This helps create a hearty, robust tomato sauce with crispy, browned morsels of meat that stand up to your spaghetti! Totally delicious and worth a little extra effort. 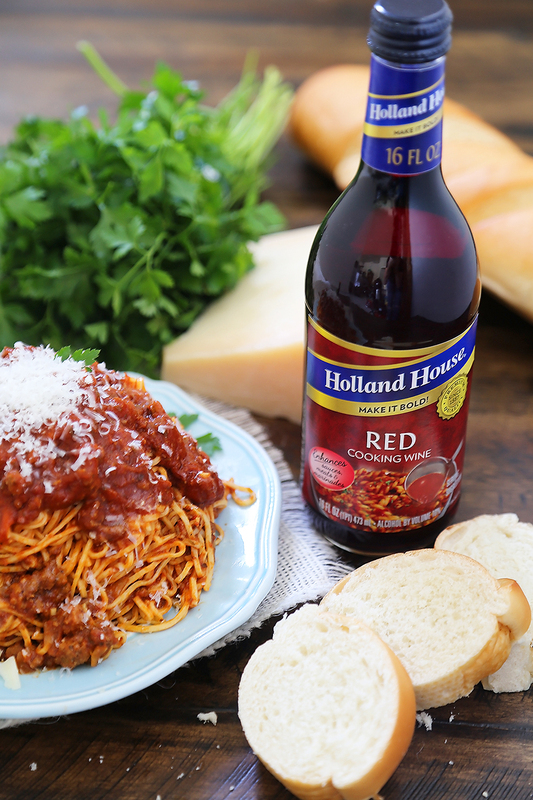 Once you have browned the beef (or turkey), onions and garlic, deglaze your pan with Holland House Red Cooking Wine. You have got to love that sizzling sound! This cooking wine is one of my greatest-ever, go-to pantry staples in the fall and winter. I use it to add an awesome flavor boost to my sauces, stews and pot roasts all season long. I love that I can just store this wine in my cabinet after using a splash, without having to worry about a large bottle going bad! It’s basically what makes this recipe turn out so vibrant and rich, so grab a bottle for yourself. Here’s a coupon! Let your wine simmer down by about half, savor that delicious aroma, and pop it all into your slow cooker with the rest of the ingredients. All that’s left to do is patiently wait 3-4 hours (if cooking on High), or up to 6 hours (if cooking on Low), and you will have the canvas for a crazy delicious dinner. Just add some hot cooked spaghetti, a sprinkle of Parmesan and some chopped basil or parsley, if you’re feeling fancy. I love to serve this meal with garlic bread and a lemony, light green salad. Receive the Holland House newsletter for delicious recipes, tips, and coupons! In a large skillet set to medium-high heat, add olive oil. Once hot, add ground beef, onion and garlic. Cook until onions and garlic are fragrant and softened, and beef is browned (crumbling as you cook), about 7-9 minutes. Deglaze pan with red cooking wine and bring to a simmer. Cook down liquid to about half, simmering for 2-3 minutes. Transfer cooked mixture to your slow cooker. 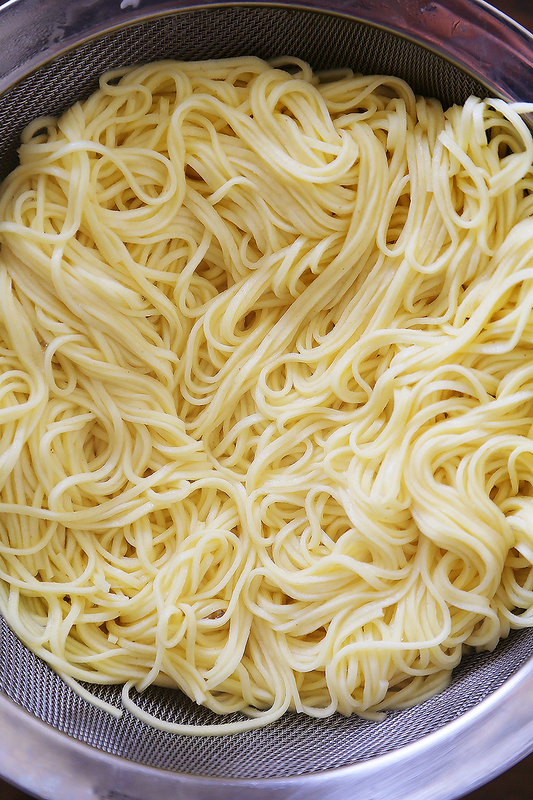 Add remaining ingredients into the slow cooker, except for spaghetti. Cook on High for 3-4 Hours, or Low for 6-8 hours. Set a large pot of water to boil. Once boiling, add spaghetti and cook according to package instructions for al dente (soft but slightly firm), about 6 minutes. Drain the pasta and return to the pot. Add 2-1/2 cups of the sauce to the pasta, tossing gently to coat. 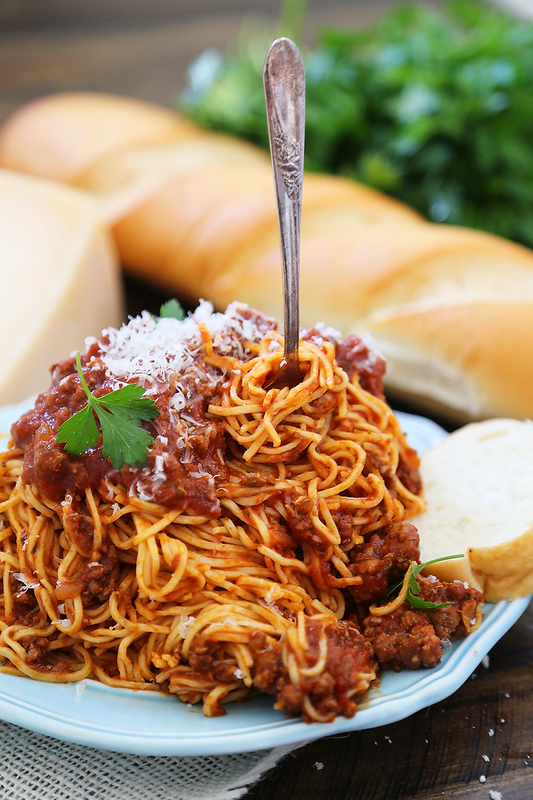 Using tongs, serve spaghetti into individual bowls and top with more sauce. Sprinkle with grated Parmesan cheese and chopped fresh basil or parsley leaves, if desired. This sauce freezes well, too! Allow to cool overnight then freeze in small portions (you can even use an ice cube tray for this step). Disclosure: This recipe was created for Holland House Cooking Wines. All opinions are my own. This looks delicious! 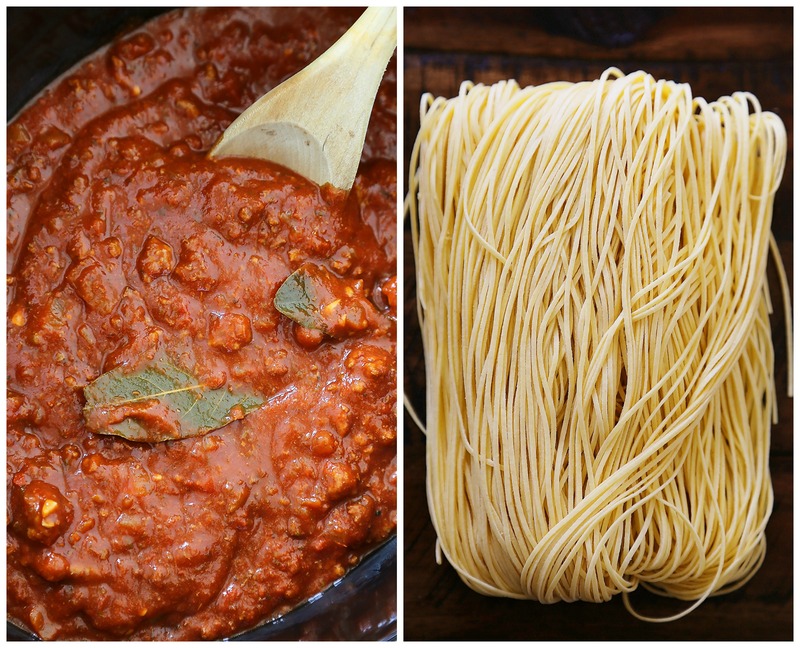 I have never tried making bolognese sauce in a slow cooker – can’t wait to give it a try! Your pictures are beautiful and anytime I can use my slow cooker and let it simmer all day as the aroma fills my home, I’m in. Thanks for this recipe!!! What a treat, everything is written down and I’ll do it for Sunday lunch. This looks so delicious I’m in. Thanks for this recipe!!! I loved this recipe, I’m going to make it this weekend. I’m sure it will be very delicious. I really liked the tips. I like the valuable info you provide in your articles. Il bookmark your weblog and check again here frequently. I’m quite certain I will learn many new stuff right here! Good luck for the next! My partner and I stumbled over here from a different website and thought I should check things out. I like what I see so now i am following you. Look forward to going over your web page repeatedly. Does your site have a contact page? I’m having a tough time locating it but, I’d like to send you an e-mail. I’ve got some suggestions for your blog you might be interested in hearing. Either way, great website and I look forward to seeing it expand over time. My spouse and i felt contented when Chris could deal with his research because of the precious recommendations he had through your weblog. It is now and again perplexing just to always be making a gift of guides which people have been trying to sell. So we fully understand we now have the writer to be grateful to for that. The main explanations you made, the straightforward blog menu, the friendships your site help instill – it’s most extraordinary, and it’s making our son in addition to the family reckon that that issue is pleasurable, which is wonderfully indispensable. Many thanks for all the pieces! I do accept as true with all the ideas you have presented for your post. They are really convincing and will definitely work. Still, the posts are very short for newbies. May just you please prolong them a bit from subsequent time? Thanks for the post. Youre so cool! I dont suppose Ive learn something like this before. So good to find somebody with some unique thoughts on this subject. realy thanks for starting this up. this website is one thing that’s needed on the internet, someone with slightly originality. useful job for bringing one thing new to the internet! I intended to post you the little bit of observation to be able to say thanks the moment again over the marvelous solutions you’ve shown at this time. This has been simply remarkably generous with you to provide without restraint what many individuals would’ve offered for sale as an e book to help make some dough for their own end, even more so considering the fact that you might well have tried it if you wanted. Those techniques as well acted as a great way to fully grasp other individuals have the same zeal much like mine to find out great deal more related to this condition. I believe there are millions of more enjoyable moments in the future for folks who see your blog. Hey! Quick question that’s entirely off topic. Do you know how to make your site mobile friendly? My website looks weird when viewing from my iphone 4. I’m trying to find a template or plugin that might be able to resolve this issue. If you have any recommendations, please share. Cheers! I have to check with you here. Which isn’t one thing I often do! I get pleasure from studying a submit that can make individuals think. Additionally, thanks for allowing me to remark! I impressed, I must say. Actually hardly ever do I encounter a blog that each educative and entertaining, and let me let you know, you could have hit the nail on the head. Your thought is excellent; the difficulty is something that not enough persons are speaking intelligently about. I am very pleased that I stumbled across this in my search for something relating to this. Hey very nice blog!! Man .. Beautiful .. Amazing .. I’ll bookmark your web site and take the feeds alsoI am|I’m} happy to find so many useful info here in the post, we need develop more techniques in this regard, thanks for sharing. . . . . .
that I really enjoyed the standard info an individual provide for your visitors? May I simply say what a comfort to discover someone who actually knows what they are discussing on the internet. side of the story. I was surprised you are not more popular given that you surely have the gift. I am encountering issues with your RSS. I don’t understand why I am unable to subscribe to it. Look advanced to more introduced agreeable from you! By the way, how could we communicate? to take into account of. I say to you, I certainly get irked even as people think about worries that they plainly do not know about. You controlled to hit the nail upon the highest as smartly as outlined out the entire thing with no need side-effects , folks can take a signal.